Space 1889, the steampunk space opera game, is now available in a Savage Worlds edition. 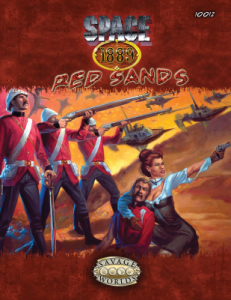 Space 1889 Red Sands presents the British Empire after its expansion to Mars, Venus, and Mercury; provides combat and construction rules for ether vessels and aerial flyers; and details a system for Inventions, an Adventure Generator, and a Plot Point campaign. The game is already shipping, but through Tuesday you can still take advantage of the preorder bundle and get the print and PDF versions for one discounted price.